I love the gorgeous pinks and the fabulous layout on this classy card. Beautiful image. Gorgeous card, I love that image, must use it soon. Wow, this is a FABULOUS entry Sylvie - love it! Thanks so much for playing with us in our colour challenge at St Luke's Charity Cards Challenge again this month. 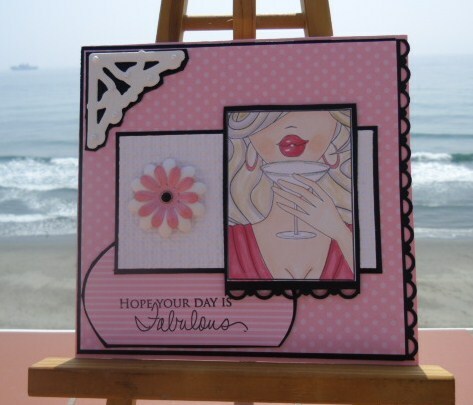 Hi Sylvie - fabulous card love the black white and pink a great layout a perfect card for our challenge over at St Lukes Charity card challenge...thank you for your continued support and hope to see you again next month. Fabulous card Sylvie. Love pink with black and white and your image is great too. Thanks for joining us at St Lukes Charity card challenge this month.